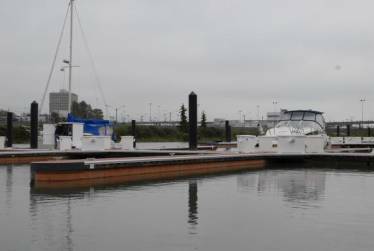 Milltown Marina is a new marina located in the historic Marpole area of Vancouver, British Columbia. The 48,000 square foot marina will feature 220 boat slips with many attractive amenities. Portland Bolt provided a wide variety of hardware for this project. The floating docks required over 400 3/4″ diameter hot-dip galvanized rods, in lengths as long as 24 feet. Our roll-threading capabilities and in-house hot-dip galvanizing enable us to manufacture these efficiently, economically, and of the highest quality. Portland Bolt provides bolts for marine projects both large and small throughout the country, and even overseas.